I worked as a Cultural Development Worker for social enterprise Eventus, based in Beighton, a former mining village in south east Sheffield. I developed and delivered the Discover Beighton project, a year-long, HLF funded initiative which engaged local people, gave them new skills, and created a record of the local heritage. I recruited, trained and supported a team of 10 local people to conduct 40 oral history interviews. I gave individual support and training to the interviewers who had a range of experience and needs. I was the point of contact for the Oral History interviewees and interviewers, including organizing their programme of activities. The interviews were intensely personal for all those involved, and interviewees were generally elderly, and sometimes vulnerable. I was responsible for ensuring everyone felt well represented and respected. Memories were provoked through themed archive events in churches, allotments and social clubs. These events were supported by visits to archives and museums including the IWM North. I trained local volunteers to create pages, edit audio and digitise images for a new website developed with Liverpool John Moores University. The site included photographs, paintings, audio extracts, songs, digitised cine film, written memories and a downloadable village heritage trail. There was a School Resource Pack created with teachers, including digital resources for use on the Smart Board. We received a national ‘Roots & Wings’ award from the Campaign for Learning for innovative work with young people. 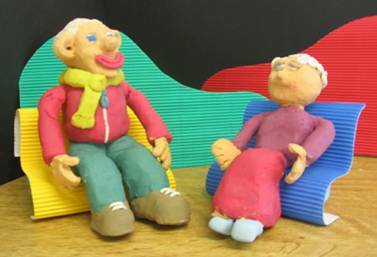 The young people selected extracts from the oral histories, then brought them to life in a digital stop motion animation. We measured the overall impact of the project using benchmarking criteria set by Yorkshire Forward, the regional development agency, which allowed us to make a strong case for the value of cultural projects in a regeneration context.